A new study suggests that sports drinks like Gatorade and Powerade have developed a dubious reputation among young people as a healthy alternative to soda, researchers say. MONDAY, September 27, 2010 (Health.com) — Advertisements for sports drinks have long featured world-class athletes such as Michael Jordan, Mia Hamm, and LeBron James. The message is clear: If you want to "be like Mike," pick up a Gatorade. This marketing strategy seems to have worked. According to a new study in Pediatrics, teenagers who are more active in sports and other physical activities are more likely than their less-active peers to quench their thirst with sports drinks, while teens who spend a lot of time watching TV or playing video games tend to drink more soda. Consuming sports drinks and other non-carbonated sugary beverages (such as fruit punch) was also linked to eating more fruits and vegetables, especially among girls, the study found. By contrast, fruit and vegetable intake tended to fall as soda consumption rose. The results aren't surprising, but the researchers say they suggest that candy-colored sports drinks have developed a dubious reputation among young people as a healthy alternative to soda. "It seems to me that people who want to pursue a healthy lifestyle are somehow being misled to believe that these drinks are somehow good for them," says the lead author of the study, Nalini Ranjit, PhD, an assistant professor at the University of Texas School of Public Health at Houston. Even one soda can provide a daily dose of sugar bigger than experts recommend. According to 2009 guidelines from the American Heart Association, adult men and women should consume no more than 37 grams and 25 grams of added sugar per day, respectively, while children should limit their intake to 12 grams. One 12-ounce can of regular Coca-Cola has 140 calories and 39 grams of sugar. Although sports drinks contain carbohydrates and electrolytes such as sodium and potassium that aid hydration, they also pack a lot of sugar. A 20-ounce bottle of Gatorade—the smallest size found in most convenience stores—contains 125 calories and 35 grams of sugar. Sports drinks "don't have as much sugar as soda, so they're not as bad," says Kelly Brownell, PhD, the director of Yale University's Rudd Center for Food Policy and Obesity. "But the last thing American children need is more sugar." Research suggests a strong link between excess sugar intake, weight gain, and obesity, and beverages are the largest source of added sugar in the American diet, says Brownell, who is also a professor of psychology, epidemiology, and public health. 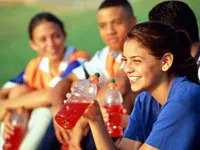 Sports drinks don't necessarily lead to weight gain, however, and they may be appropriate for some student-athletes and other active young people. For kids participating in football practice, a soccer game, or other intense activities on a hot, humid day, the American Academy of Pediatrics (AAP) approves small amounts of non-carbonated sports drinks—about five ounces for every 15 to 20 minutes of exercise. In milder weather, kids don't need sports drinks unless they're active for more than three hours at a stretch, according to the AAP, which publishes Pediatrics. According to the American Dietetic Association, it's OK for older teens and adults to consume sports drinks after moderate to high intensity activity that lasts more than an hour. Dehydration is a common hazard for young athletes, and studies suggest that the flavor of sports drinks may encourage kids to stay hydrated. In a series of studies conducted at McMaster University in Canada, researchers found that kids who biked for 90 to 180 minutes drank almost 50% more water when it was grape-flavored. If they were offered a sports drink, they drank 90% more than if they were offered only water. Still, Brownell says, many teens who are consuming these drinks aren't exercising hard enough to need them for hydration. "People who are engaging in any kind of athletic activity have been led to believe they need these drinks," he says. States including Massachusetts, Pennsylvania, Illinois, and California have banned soda from school vending machines and cafeterias in recent years, and public officials are now turning their attention to sports drinks and other sugary beverages. The California legislature, for one, is considering a ban on all sugary sports drinks in schools. "Legislative efforts have heavily focused on sodas," says Ranjit. "There are other beverages out there that are also not good for kids that we should be looking at, like energy drinks and frappaccinos. This overemphasis on soda may be letting some other drinks off the hook."